BeWILDerwood01692 633033work Theme ParkBeWILDerwood is an award winning wild and imaginative outdoor adventure park. With magical treehouses and hints of intriguing characters, BeWILDerwood brings a curious difference to The Broads. The concept, put quite simply, is one of child’s play. The vision: to enhance an already striking natural playground and encourage children and their families to enjoy traditional, imaginative and healthy outdoor play together. A day at BeWILDerwood, means endless hours spent together with family and friends, exploring and engaging in the wild Norfolk landscape. Building dens with bracken and sticks, taking lazy boat rides across Scaaaary Lake, dressing up and joining in with the enchanting daily story telling; crossing Jungle Bridges and visiting Treehouses, whizzing down Wobbly Wires and getting befuddled in the marvelous Muddle Maze; snaking through the peaceful pathways and revealing treacherous trails - this is a world with more than a little sprinkling of fairy dust. BeWILDerwood is home to enchanting creatures such as Boggles, Twiggles, the Thornyclod Spider and vegetarian Crocklebogs! The setting for the book, “A Boggle at BeWILDerwood”, by local children’s author Tom Blofeld, gives children the chance to follow in the footsteps of the lead character Swampy, a 2ft Marsh Boggle with a taste for adventure. High in the trees there are miniature Twiggle villages and low in the marshes Boggle village life will captivate your imagination. As you step inside the pages of Tom’s books – a character world of Boggles, Crocklebogs and Twiggles is brought to life in a quietly telling, yet unassuming way; leaving ample time and space for young people to realise their very own make believe. BeWILDerwood has lovingly-made, locally sourced food and drinks on hand; the Munch Bar, The Cosy Cabin and the Snack Shack serve everything from famous Norfolk ice cream to the award winning Norfolk Archers sausages in rolls. 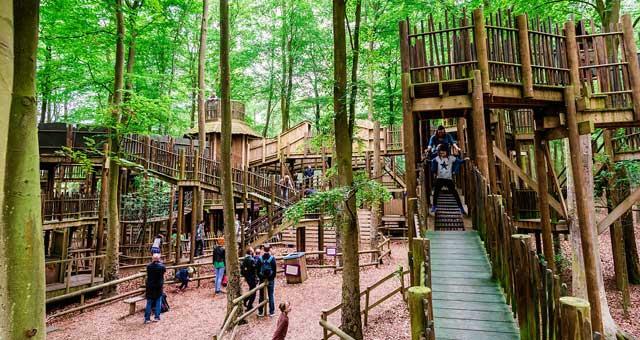 BeWILDerwood is an award winning wild and imaginative outdoor adventure park. With magical treehouses and hints of intriguing characters, BeWILDerwood brings a curious difference to The Broads. To BeWILDerwood, is to party! A time for fun, dancing, exploring, playing, sharing adventures and giggles and the Twiggle Team know how to throw a celebration! Lots of events are run throughout the season so check out the website for more details. Please see our website for opening times and prices. There is a discount for booking online in advance. From A1151 Norwich road, turn onto the A1062 towards Horning, from the double mini roundabouts. continue on the A1062 for approx. 1.5 miles. BeWILDerwood is on your left.